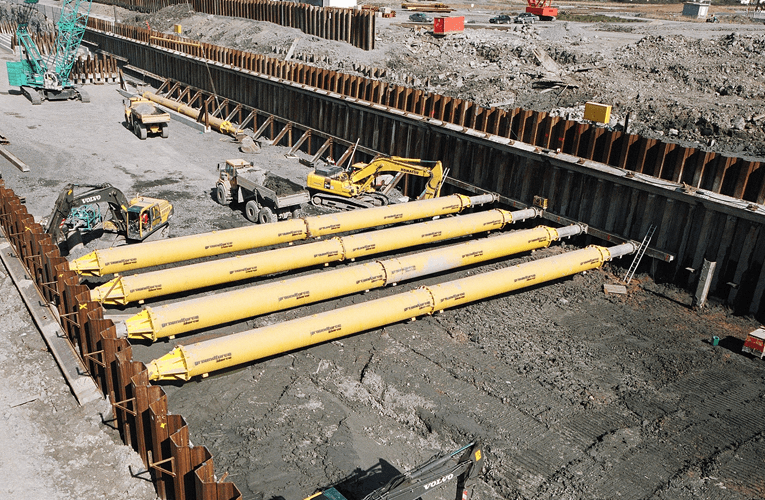 Five tunnel units, each 100m in length, are being pre-cast in the casting basin on the north bank of the Shannon. When completed, the basin will be flooded and the tunnel units will be floated out and sunk into a pre-dredged channel across the river. The tunnel will be completed at each end by cut and cover sections and approach ramps. The construction work is being undertaken by a joint venture contractor comprising the partner sub-contractors of Lagan, Roadbridge, John Sisk and Strabag. The main challenges facing the construction team on the casting basin phase all stemmed from the immense size of the basin itself. Measuring 550 m long, 33 m wide and 9 m deep, the basin has to accommodate all five tunnel sections at once. To complicate matters, the soft alluvial soils found on the banks of the river extend to a depth of 12 m or more, presenting very poor ground conditions. The very high lateral loads generated by this depth of excavation required a robust, specialised temporary works solution. Furthermore, the shoring system would have to support the sheer walls of the excavation while at the same time leaving sufficient space between the walls in which to excavate the basin. wall was left as a permanent component of the new retaining structure. A bespoke solution, involving the on-site fabrication of structural steel sections was ruled out for a number of reasons, including high costs and time constraints. As an alternative to fabricated structural steel, Groundforce Shorco proposed a solution employing its new Super MP250 struts bearing on waling beams welded to the top of the steel sheet piled retaining walls. The Super MP250 struts, developed in 2006 from the standard MP250 design, are the largest proprietary hydraulic struts available anywhere in Europe.These struts are capable of supporting a maximum 250 tonne load across a clear span in up to 45 m. This has been achieved by fitting a new 1,200 mm diameter extension tube in place of the standard 600 mm diameter tube. The smaller tube requires intermediate vertical propping when supporting spans of more than 25 m.
The Groundforce Shorco range of hydraulic struts (which also includes the 50 tonne capacity MP50, 80 tonne HSK80, 125 tonne MP125 and 150 tonne HSK150) is designed for safe installation and removal on site without the requirement for labour-intensive and time-consuming welding and cutting of bespoke steel sections. The sides of the casting basin were supported with steel sheet piles driven into the ground and supported with Groundforce Shorco’s Super MP250 struts bearing on steel waler beams welded to the top of the piled retaining wall. The construction sequence started with the piles being driven down to firm strata. A waling beam was then welded along the top of the row of piles and tied back with ground anchors before excavation commenced within the piled area. Once the excavation work had started, the Super MP250 struts were craned in and positioned between the waler beams. They were then hydraulically extended to the correct load required to support the sides of the deepening excavation. Due to the exceptional length of the excavation, the basin was excavated in phases, with six Super MP250 struts being used sequentially as work progressed. As the excavation reached full depth, permanent steel and concrete composite U-beams were dropped into the basin to carry the lateral loads. The Super MP250 struts could then be lifted out and moved up to the next section to be excavated. The props on this project were acting at full axial capacity with a span in the region of 32 m.
The Super MP250 struts have enabled main contractor Roadbridge to install the 83 precast concrete composite U-beams in just over 12 weeks, nearly half the 20 weeks originally estimated for the task. The hydraulic ram unit on the Super MP250 struts allowed actual loads to be monitored and checked against the design assumption ensuring safe construction.